After six months, I had only my second dream about Trey last night. I don’t make too much of dreams, but it sure is nice to see him there. All I remember from my dream is that I was standing at the altar during the invitation at the end of one of our church worship services. I don’t know why he came forward, but I just picked him up and held him. In my dream, I remember thinking I need to take him to Emily because if other people come forward, I need to talk to them…but I didn’t want to put him down, and he wouldn’t let me go. He held onto me so tight, and it felt so good. I remember thinking in my dream that his embrace just felt so right…it was perfect and I could have held him forever. His arms and legs were wrapped around me! Today is a tough day though. Normally, Emily and I would be putting the final touches on Trey’s 8th birthday party today, that would have been this Sunday. But, instead, we grieve with hope and look forward to eternal celebrations. I told Emily this morning that there will be endless celebrations in heaven when we are with our God and King forever. BUT…all Christians must remember, that to share in Christ’s eternal glory, we must share in His earthly to sufferings. As Paul said, “I want to know Him…through the power of His resurrection and the fellowship of His sufferings!” We, of course, do not grieve for Trey! He is in the presence of God and feels nothing but immense, eternal joy…and we give God great praise for that! 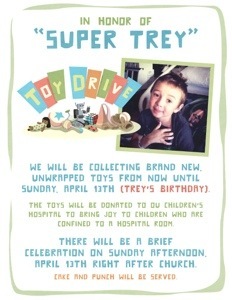 As a way of honoring Trey though, we are collecting toys that we can take to the OU children’s hospital for his birthday. If you are in this area, don’t forget to bring a toy with you to church this Sunday! Make sure it is a new, unwrapped children’s toy that can be easily cleaned (in the hospital, they like toys that can be wiped down).